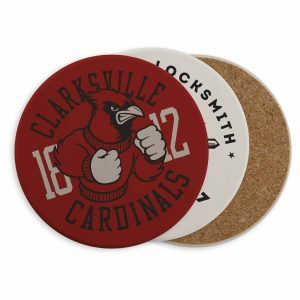 Why consider custom coasters for your next promotional event? What we eat is often at the center of our social lives. 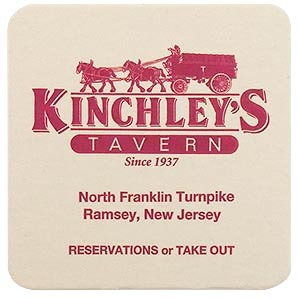 From a fancy top of the line dinner event to just grabbing a few beers after a hard day at work, we tend to associate eating and drinking with fun, entertainment, and good times. 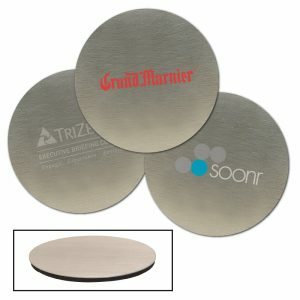 Directly associating your marketing band, logo, or other message with that social cue can be quite effective. 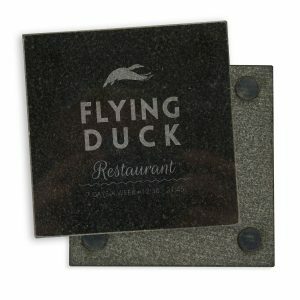 Make the most of every occasion to promote brand awareness with custom coasters for your restaurant, bar, event or party! 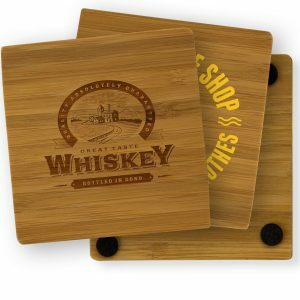 Add to the dining atmosphere with customized coasters that communicate a message for your guests every time they pick up a glass. 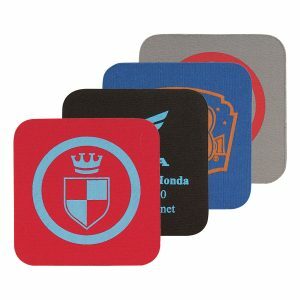 Coasters can be utilized as a part of your happy hour to give discounts on drinks, or even as a coupon for future use. 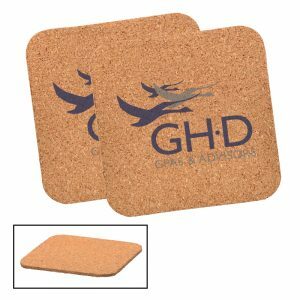 In gift sets, imprinted coasters give your logo a lasting source of brand awareness- perfect for employees! 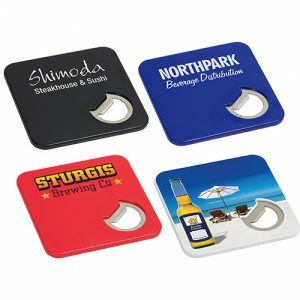 Promo Excitement carries a large variety of different coaster styles, materials, and colors to choose from, ranging from low-cost to classy, modern designs. 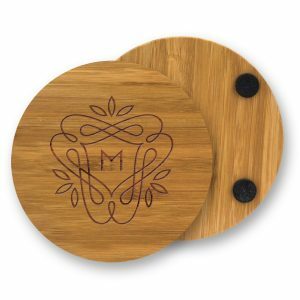 Feel free to ask customer support if you have a specific shape or design in mind, chances are we can provide what you are looking for even if it isn’t listed on our site. 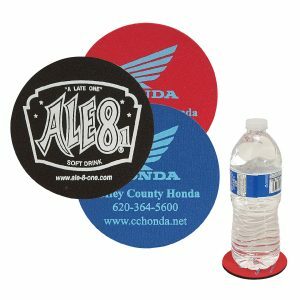 No matter what your business or special event needs are, we are sure to have the perfect custom coaster for you! 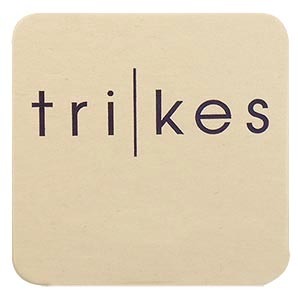 Quantity Price (ea.) 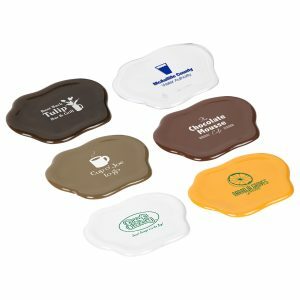 150 $1.59 500 $1.52 1000 $1.47 2000 $1.40 4000+ $1.35 $50.00 Setup Charge Colors: Black, Blue, Red, White Imprint: pad print: 2.5" x 1" or digital: 3.2979" x 3.2979" Product Size: 3-3/8" x 3-3/8" x 3/16"
Quantity Price (ea.) 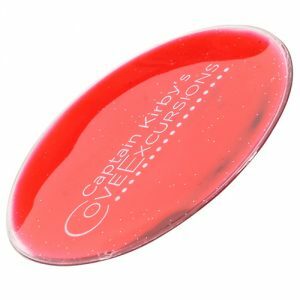 150 $0.90 250 $0.87 500 $0.85 1000 $0.84 2500+ $0.82 $50.00 Setup Charge Colors: Red, Green Imprint: 2.5" x 0" Product Size: 3-3/8" dia.x 1/16"
Quantity Price (ea.) 100 $0.80 250 $0.75 500 $0.70 1000 $0.65 2500+ $0.60 $50.00 Setup Charge Colors: cork Imprint 3" Dia. 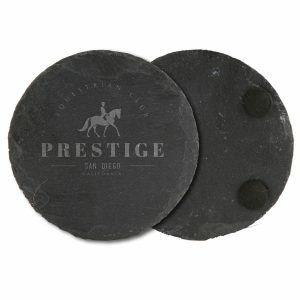 Product Size: 3 1/2" Dia. 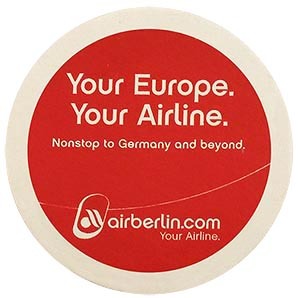 Quantity Price (ea.) 100 $0.80 250 $0.70 500 $0.65 1000 $0.60 2500+ $0.58 $50.00 Setup Charge Colors: White, Black, Red, Blue, Grey Imprint 3" Dia. Product Size: 3 1/2" Dia. Quantity Price (ea.) 250 $0.79 500 $0.77 1000 $0.75 3000 $0.74 5000+ $0.72 $50.00 Setup Charge Colors: Cappuccino, Chocolate Milk, Cola, Milk, Orange Juice, Water Imprint: 2" x " - 1 color imprint Product Size: 4-7/8" x 3-5/8"
Quantity Price (ea.) 250 $0.79 500 $0.77 1000 $0.75 3000 $0.74 5000+ $0.72 $50.00 Setup Charge Colors: Blue, Forest Green, Orange, Red, Teal, Yellow Imprint: 2" x " - 1 color imprint Product Size: 4-7/8" x 3-5/8"
Quantity Price (ea.) 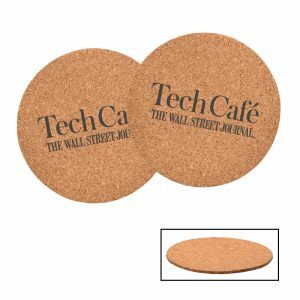 100 $0.80 250 $0.75 500 $0.70 1000 $0.65 2500+ $0.60 $50.00 Setup Charge Colors: cork Imprint 3" x 3" Product Size: 3 1/2" x 3 1/2"
Quantity Price (ea.) 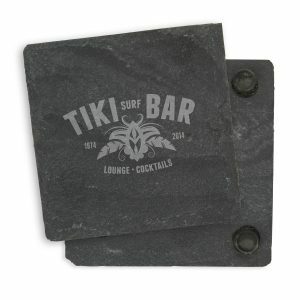 50 $3.87 100 $3.52 250 $3.26 500 $3.07 1000+ $2.90 $50.00 Setup Charge Colors: granite Imprint: 2.25" x 2.25" setup includes screen print, laser engrave also available Product Size: 3-15/16"w x 3-15/16"h.
Quantity Price (ea.) 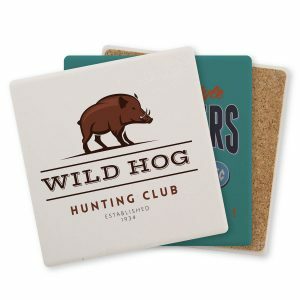 100 $0.80 250 $0.70 500 $0.65 1000 $0.60 2500+ $0.58 $50.00 Setup Charge Colors: White, Black, Red, Blue, Grey Imprint: 3" x 3" Product Size: 3 1/2" x 3 1/2"
Quantity Price (ea.) 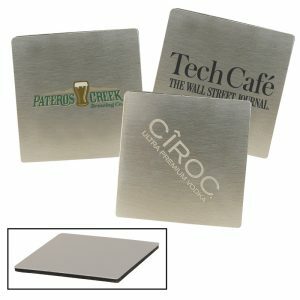 50 $2.30 100 $2.20 250 $2.10 500 $2.00 1000+ $1.90 $50.00 Setup Charge Colors: Stainless Steel Imprint: 2 1/4" Dia. 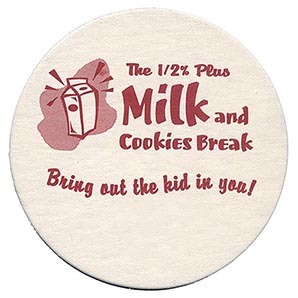 Product Size: 3 1/2" Dia. Quantity Price (ea.) 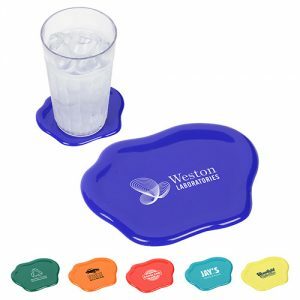 50 $2.30 100 $2.20 250 $2.10 500 $2.00 1000+ $1.90 $50.00 Setup Charge Colors: Stainless Steel Imprint: 2 1/4" x 2 1/4" Product Size: 3 3/8" x 3 3/8"